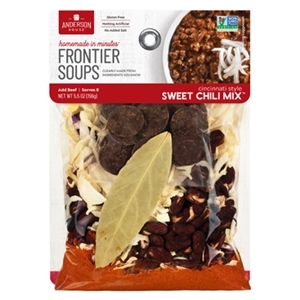 "Secret" ingredients of dark, unsweetened chocolate and cinnamon give Frontier Midwest Weekend Cincinnati Chili this fast and fantastic chili its authentic character and versatility! Our version can also be served in a bowl with shredded cheddar, in a bun, barbecue style or Cincinnati-style. Crumble and brown ground meat in a 3 to 4 quart pot with 1 or 2 tablespoons oil, if desired. Add contents of chili mix. Stir in additions above, bring to a simmer, add contents of chocolate packet and cook on medium-low heat, covered, for 25 minutes. Serve up this crowd-pleasing Cincinnati-style on top of spaghetti, in a bowl with grated cheese, or as a barbeque beef style sandwich in a soft bun. Red kidney beans, chocolate, onion, cinnamon, garlic and spices; Gluten-free. Absolutely fabulous chili--great with ground beef or ground turkey. The sweet BBQ sauce is a MUST to use.